India, Absence of Will Among Politicians: and Bureaucrats: The Joint Intelligence Committee: (JIC), Crisis Management Mechanism; The Home: Security: Selection and Duties; Strategy in Pakistan: 4. Strategies and Options 69: Conceps, Courses and Options--(I) Need for: National Policy (II) Maintenance of Local Autonomy: (III) Propagatorly Pluralism as an Emotional: Programme, (IV) Develop an Institutionalised: Strategic System, (V) Weeding out Corruption (VI): Economic Policy Aimed at Countering Militancy: (VII) Gathering International Support in Fighting: Proxy War. (VIII) Addressing Problems of Youth (IX): Improving the Criminal Justice System, Developing: an Effective Intelligence System (XI) Exploiting the: Disillusionment of Civil Population (XII) Insisting on: Transparency (XIII) Maintaining Healthy: Relationship with Expatriats: 6 Terrorism in India: 5. Tackling Terrorism 97: Routing Terrorism: North East and South India, The: Degeneration of Movements; Crushing Militancy in: Punjab; Victory over Terrorism in Assam; The: Failures While Containing Militancy: 6. India a Victim of Terrorism 131: Terrorism in Vogue Worldwide, The Case of India;: Aiding Terrorism from Foreigh Land by Expatriats;: Unwarranted Excesses; The Role of Media; The: Chrar-E-Sharif Burning: 7. Power Rivalry in the Indian Sub-continent 153: Situation Prevailing Before The Disintegration of: V.S.S.R, Gaining the Strategic Advantage: The Super: Powers; The Sowiet Stand; India's Stand in the Subcontinent;: Establishment of Peace Zone; The Indian: Navy (Vessels); Nawal Aircraft. : 8. The Ugly Faces of Terrorism 165: Militancy in North-East, Militancy in Assam,: Mizoram's Predicament, Isolation in Tripura,: Tribulations in Nagaland, Gun-running in the North-: East, Turbulence in Punjab Banks. : 9. Roots of Repression in the North-East: The Army: Excenes 185: Special Power Legislations for the Army, The: Military Solution to Insurgency, Anti Insurgency: Operations, Human Rights Violations and Army: 10. Development of Autowonious Councils in the: North-East 201: Socio-cultural Aspect of the North Easr, Community: Perceptions Related to Autonomy, Assamese: Discord, The Insurgents and their Struggle, Bodo: Autonomy: From Representation to Insurgency,: Towards Autonomy, Working of the Autonomous: Councils, Democracy and Insurgency Rhetoric. : 11. 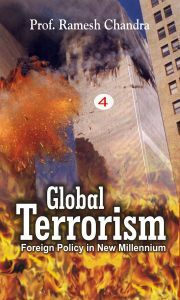 The Global Jihadi Movement 231: Spreading of the Jihadi Movement, Jihad in the: Northern Caucasus, War in Dagestan, The Jihadi: Contents 7: Terror in Kashmir, Terrorist Organizations, Pakistani: Designs in Kashmir: Post Script 245: Appendix 1: Terrorism: Some Statistical Indicators: Appendix 2: Terrorism in Punjab (Dates/Cases): Appendix 3: Terrorism in North East (Dates): Appendix 4: Left-Wing Terrorism (Dates/Cases): Appendix 5: Islamic Groups/LTTE: Bibliography 287About The Book:- Since The Days Of Yore, Terrorism Had Deep Linkage With Our Changing Modes Of Civilisation. The Acts Of Violence Are The Glaring Phenomenons Which Are Very Often Used To Oust A Ruler Or A Despot. The Methods Are Ferocious In Contents: They Are Guns, Letter Bombs, Conventional Explosives, Kidnapping, Demand For Ransom Money And Airline Hijacking. Thus Terrorists Can Attack Anything, Anywhere And At Any Time.